MRSA is a strain of Staphylococcal bacteria that has become immune to some antibiotics. Why is MRSA Important? 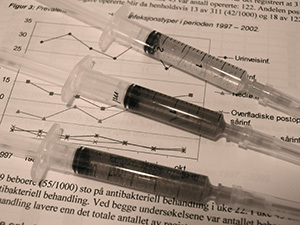 Invasive MRSA infections are associated with approximately 19,000 deaths per year. .It is contagious and easily transmitted from person to person by skin to skin contact or contact with an object or clothing that recently had contact with a MRSA- infected individual. MRSA often begins as a skin infection and if left untreated can spread to the blood or other organs causing infection and death. It was once thought of something you only contract in a hospital but is becoming more widespread in communities. To learn more about MRSA and its effects go to www.fastmed.com. MRSA is easily spread to other individuals by people with the organisms on their skin. Usually, either skin-to-skin contact or contact with towels, razors, or even doorknobs or benches can transfer MRSA to another person. Some people, termed carriers, have MRSA strains on their body but have no symptoms; however, these people can still transfer MRSA to others by direct and indirect contact (towels or clothing that carriers have used).